Transaction Approval allows you to verify and approve the transactions that your employees create in Zoho Inventory. So, only the transactions that are approved reflect in your accounts and reports. Introducing an approval workflow helps to avoid situations where a wrong item or an incorrect quantity may be recorded while making a purchase. Let’s look at a scenario to understand this better. Jason is a business owner and has multiple employees working for him. A newly appointed staff in the purchase department accidentally sends out a purchase order with a wrong quantity. Jason figures this out and wonders how he could have prevented this in the first place. Immediately, he sets up an approval workflow to ensure that all purchase orders his employees send has their managers’ approval. Let’s see how you can set up transaction approval to prevent any possible mishap. The first step in setting up the approval workflow is to enable the approval option to start approving transactions recorded by the users in the organization. Click the Gear icon from the top right corner and select Preferences. Head to the General tab and check the Sales Transactions or/and Purchase Transactions under the Transaction Approval section. Note: If you have an integrated Zoho Books account, then you will have to enable this feature through the Zoho Books organization. Once you have enabled transaction approval, you can set your approval preferences. This will help you to restrict and define the role you would like to offer your approvers. You will be able to find Approval Preferences below the Transaction Approval section. Check or uncheck the box if you would like to enable or disable a preference. Notify when transactions are submitted for approval: Whenever a transaction is submitted for approval, an email notification will be sent to the approvers. You can choose to send the notification for all approvers or only to one approver of your choice. Notify the submitter when a transaction is approved: You can also choose to notify the submitter when a submitted transaction has been approved by checking the box. The users with Admin role have access to approve transactions. However, you can further extend this to your co-workers and add them as approvers. Approvers are users of the organization other than the Admins who have approval access. 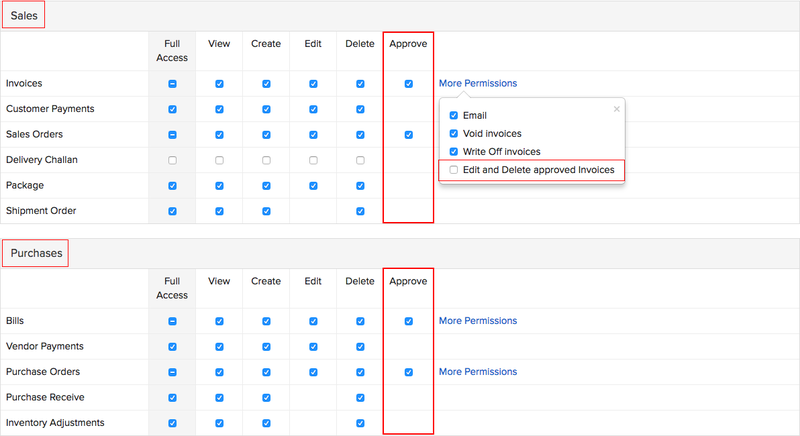 You can add users to your Zoho Inventory organization and enable approval permissions. Click the Gear icon from the top right corner and select Users & Roles. Navigate to the Roles tab and create a new role by clicking the New Role option. Alternatively, you can also duplicate an existing role by clicking the clone button. Enter a new name for the role created and select the modules you wish to give the user access to. Navigate to the Purchases/Sales section. Check the box in the Approve column to provide approval permissions for sales and purchase transactions. You can also allow approvers to Edit and Delete Approved Transactions by clicking the More Permissions option. Navigate to the Users tab and click Invite User. 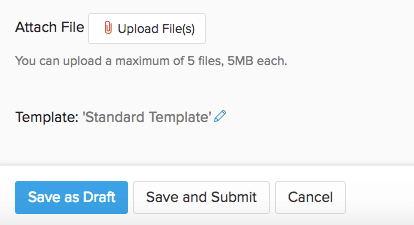 Enter the details in the pop-up and select a Role you would like to assign to the user and click Send. Immediately, an email will be sent to the prospective user. The user needs to click the Join Account link sent to him via mail to start using Zoho Inventory. Note: You can learn more about Users and Roles here. Click the Gear icon in the top right corner and select Users & Roles. Navigate to the Roles tab and click Edit. Navigate to the Purchases/Sales section and check the appropriate boxes in the Approve column to provide approval permissions. Invoice: Mark Invoices as Sent, Record Payments, Write Off and Mail invoices. Sales Order: Create Invoice, Convert to Purchase Order, Mark as Confirmed, Email Sales Orders, Create Package and Create Shipments. Navigate to the Invoice/Sales Orders tab in your Zoho Inventory homepage. Record a new Invoice/Sales Orders. Click Save as Draft to save the transaction or click Save and Submit to save and submit the transaction for approval. You can also click Save and Print to print the transaction (In case of an Invoice). You will receive a notification once your transaction is approved. As soon as transactions are submitted, the respective approvers can approve them. Navigate to the Sales module from your Zoho Invoice homepage. Select the respective Invoice/Sales Order. The Approvers will be able to approve the transactions they create by selecting Save and Approve from the dropup. The Approvers can click Save and Submit for further verification by other Approvers/Admins or choose any option they would like to perform on the transaction. Once the transaction has been approved, the users of the organization will be able to perform all actions associated with the entity as mentioned above. Bills: Record Payments, create and use Vendor Credits. Purchase Orders: Convert to Open and Convert to Bill. The first step is to create transactions and submit them. The submitted transactions will be further processed once the approver has verified them. Navigate to the Purchase Orders/Bills tab in your Zoho Inventory homepage. Record a new Bill/Purchase Order. Click Save as Draft to save the transaction or click Save and Submit to save and submit the transaction for approval. Navigate to the Purchases tab from your Zoho Inventory homepage. Select the respective Bill/Purchase Order. The Approvers can approve the transactions they create by clicking Save and Approve. The Approvers can also click Save and Submit for further verification by other Approvers/Admins. Once the transaction has been approved, the users of the organization will be able to perform all actions associated with the entity. Note: Once you approve a transaction, you cannot undo this action. You can however mark the transaction as Void and later convert it to the Draft state.